Posted on March 22, 2013 by Worth Stopping By . . . In order to understand the perfection that is Quebec’s Lower Town, you must first get a picture of the geography of the region. The Upper Town lies on the top of the Cap-Diamant (Cape Diamond) promontory. A high stone wall surrounds this portion of the city, and it remains the oldest walled city north of Mexico. Quebec’s Lower Town is located at shore level below Cape Diamond. Pedestrians take a funiculaire (a kind of escalated cable car) that runs between the two levels. And then, as you enter “Old Quebec”, you step into another dimension. Once you step into the Lower Town, you find yourself on the oldest street in the city, Rue Petit Champlain. It is quaint, serene, just beautiful in every way. We took our time strolling and stopping into the shops and galleries that line the street. 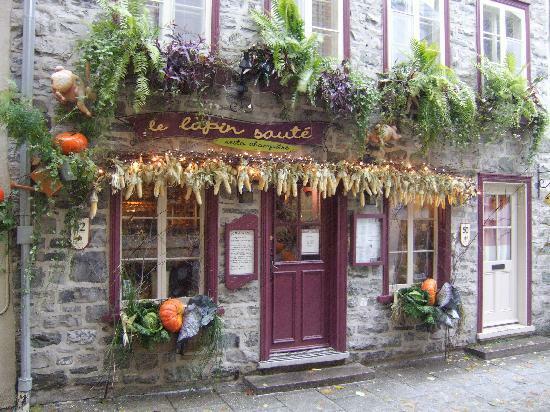 We passed several bars, restaurants, and hotels until we came upon a little gem of a place, Le Lapin Saute. We were seated on the patio and finally sat back to soak up everything. And everything was there – a little sunshine, a little breeze, a view of the river, a few little birds to entertain us, the sound of street musicians, and later . . fabulous food, lively conversation, a wonderfully, pleasant afternoon. The menu here is as varied as it is thoughtful. – although I won’t say it’s necessarily vegetarian friendly. Although it offers a beautiful Mushrooms, Port wine, and Potatoes Casserole, most items lean toward duck, pork, salmon, and, of course, RABBIT! This restaurant is a perfect stop at any time of day. So many choices: from the Pear & Cranberry Turnovers – to the Duck/Salmon/or Rabbit Salads – to the Rabbit lasagna with camembert sauce – to the Rabbit Pie. Ron dove right in ordering their Rabbit Pie – rabbit, potatoes, mushrooms, and shallots served with a green salad and homemade chutney. The crust was golden brown, flaky and beautiful. Of course, I ordered . . . Chicken! I have to say that we really enjoyed their delicious and inventive cuisine. We were so happy to find this little corner of heaven, and to have a moment to linger there. Le Lapin Saute is romantic both day and night.